If you're getting ready to trade in your old car or buy a used vehicle, it helps to know The Black Book value of your car. For over 50 years, The Black Book has been a respected resource in the automotive industry. Now published in both print and electronic forms, The Black Book has evolved over the years to become one of the foremost sources for U.S. and Canadian used car values. For years, auto dealerships have used The Black Book to ascertain car values. 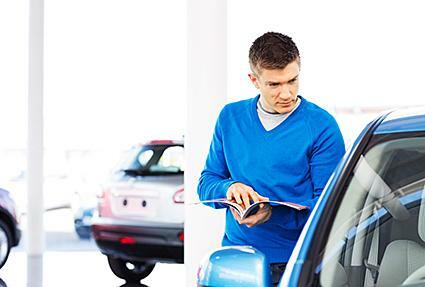 Knowing the wholesale value of a car helps them set prices and establish trade-in values. However, dealers aren't the only ones who can use The Black Book; it can be a helpful resource for individuals as well. Here's how you can use this service. Before you can access the library of car values, you'll need to become a Black Book subscriber. To do this, you can call (800) 367-3759 or visit The Black Book website. Depending on how often you need to access the valuation information, you can choose print or Internet-only information and daily, weekly, or monthly updates. Expect to pay between $238 and $468 per year for the service. Black Book Daily - This publication updates used car values daily. Keep in mind that if you purchase the book form, you will also have the option to look at the daily updated values on the Internet. Black Book Finance Advance - GMAC is the only lender that recognizes Black Book used vehicle values, and this publication will tell you what GMAC will lend on a certain year, make, and model vehicle. Black Book Activator - Certain dealerships or used car lots that sign up for Black Book resources can opt into this program. With this option, you can browse a dealer's inventory on the Internet. Handheld, Internet Data, and Custom Solutions - If you want Black Book values on your mobile device, this Black Book resource is great when you're car shopping and not near your PC or laptop. Log in to Black Book's Internet Suite, which gives you access to all of the organization's valuation tools. You can look up new car values, used car values, motorcycles, historical sales data for car models, and more. You can also use the service to find the value of several vehicles at a time. Select your vehicle's year, make, model, series (if applicable), and color. Enter your mileage and zip code. Select or deselect features, options, and equipment for a more accurate estimate. Fill out the form that describes your vehicle's interior and exterior. Enter your contact information, including email address, phone number, and address, and the make of vehicle you want to purchase. GM Certified also has the same estimator for Black Book values. You may also find the estimator on your local dealership's website, too. When you use a free Black Book value calculator, you are only getting an estimated Black Book car trade-in value. Visiting a dealer may result in a different valuation depending on the current information available, along with market pricing changes, their assessment of your vehicle, and more. Black Book keeps quiet about its exact formula for establishing wholesale car values, but the organization does share some information about its sources and methods. Team members attend more than 50 vehicle auctions each week. They record sales prices and talk to dealers about trends. In addition, Black Book receives daily transmissions of sales data and has special software to help organize this information. You may notice that The Black Book value you receive is significantly lower than the sticker price or trade-in value for the vehicle. That's because The Black Book provides wholesale or auction values. This is the price a dealer might pay for your car at an auction or trade event, allowing for the money the dealer would need to invest to prepare the car for sale. When you're considering trading in your car or selling it to a dealer, The Black Book value is only a guideline. Leo Marquez, a sales manager at a Ford dealership in New Mexico, says pricing also depends on other factors. "Even if your car is in mint condition and has low miles, if I already have four of the exact same car sitting on my lot, I'll offer you a lower value," says Martinez. "On the other hand, if I want or need your car, I may offer you a little more. If you're armed with a Black Book value, visit a dealership or used car lot at the end of the month. The end of the month is when we really need to hit our sales goal numbers and chances are, you'll get a better trade-in value then." Auto Black Book values can be handy if you plan to work with a dealership that visits auctions weekly. With a Black Book auction value in hand, you can ask a dealer to try and obtain the vehicle you want at the auction. If they can obtain the vehicle you want at an auction, and at The Black Book value, most dealerships and used car lots will expect to make between $1,800 and $2,200 on the vehicle. This means that the price you pay will not be The Black Book value, but you can negotiate. The value you receive from Black Book may be significantly lower than the invoice price of the car. Wondering if The Black Book might be useful for you? Before you plunk down hundreds of dollars for a subscription, answer the following questions. How Valuable Is Your Vehicle? Consider the rough value of your vehicle. If you're simply trading in an ancient hatchback, paying the subscription rate will be impractical. However, if your car is worth a lot of money, especially if it's a classic vehicle, The Black Book could be an important source for its value. How Often Will You Use The Black Book? Know how many times you plan to use the subscription in the next year. Will you be trading in or selling several vehicles? Will you be making a lot of car purchases? If so, you could very well get your money's worth out of your subscription. The Black Book value will give you a significant advantage in negotiations. Is Your Vehicle in Good Condition? Remember that there are many factors to consider when seeking an auto valuation. Beyond exterior and tire condition, the vehicle's mileage, equipment options, and the area where you live all play a large part in determining value. Depending on your situation, finding The Black Book used car value of your vehicle can help you save money. However, this source isn't for everyone. If you won't be using the service a lot, Kelley Blue Book or another valuation tool may be better. Regardless of where you get your information, doing your research is extremely important when you buy or sell a car.